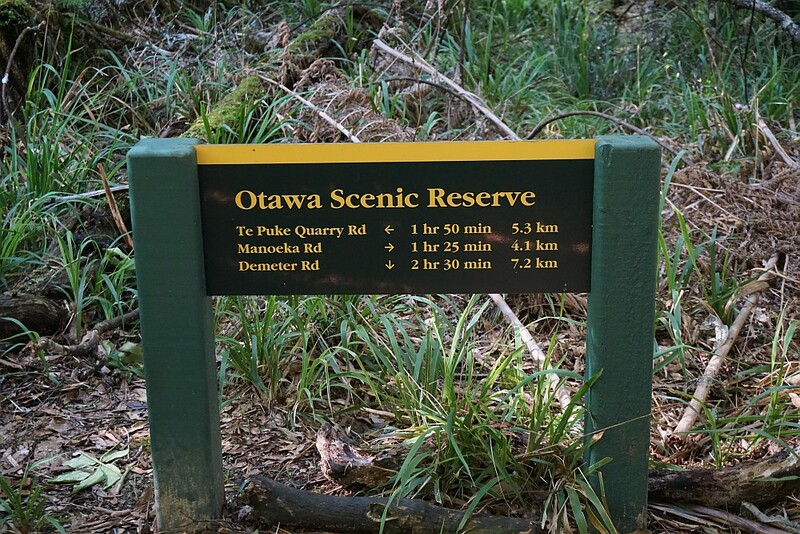 More details about the Otawa Scenic Reserve and the Otawa Trig track can be found on the DoC web site. There is a small parking area on Te Puke Quarry Rd, across the road from Reid Rd South. 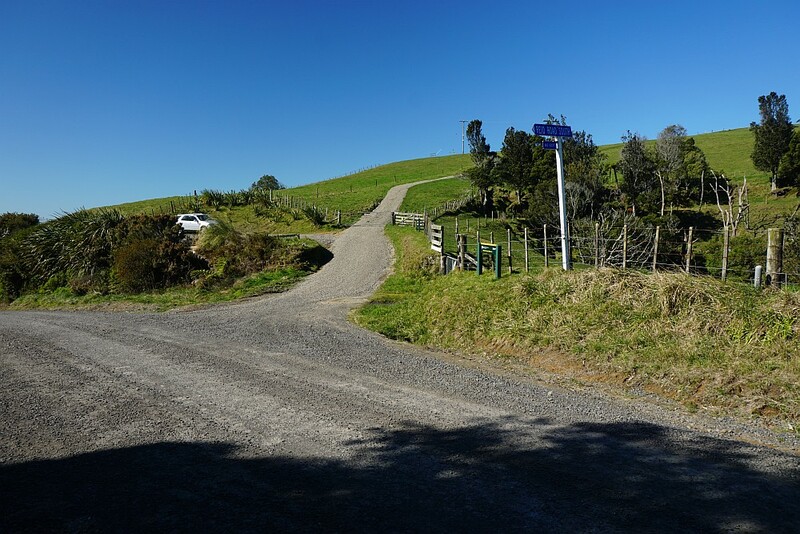 Te Puke Quarry Rd at this point is a narrow, winding gravel road. There are no facilities at the parking area. 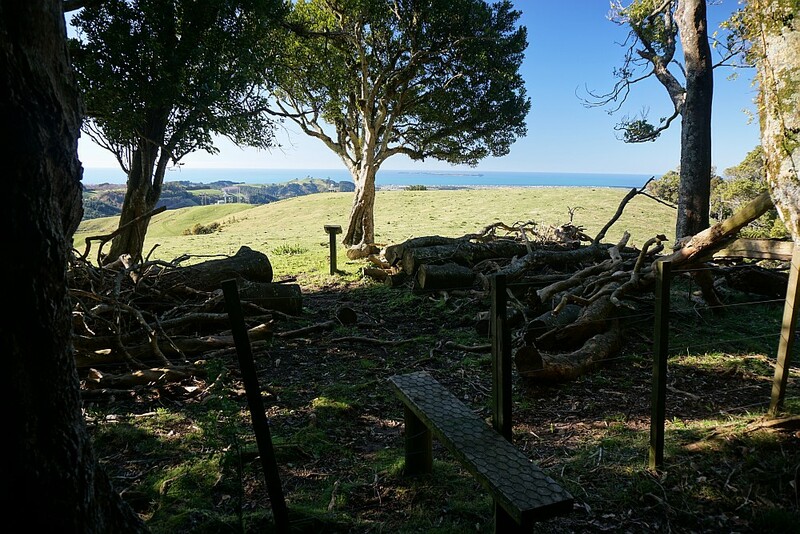 The first part of the track crosses over private farmland before reaching the boundary of the scenic reserve. Cattle or sheep may be grazing on this part of the walk. 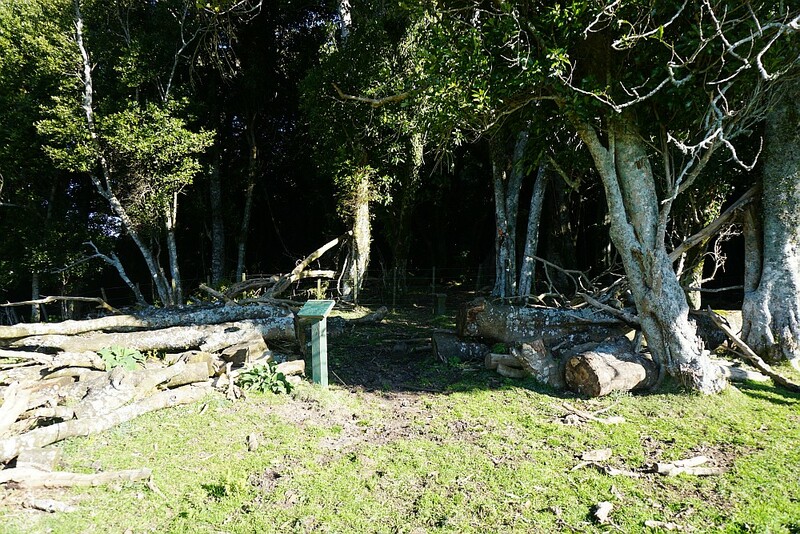 The remainder of the walk is through regenerating native bush, mostly following a ridgeline directly to the Otawa Trig. Most of the track has an easy contour, but there are a few steeper ascents and descents, especially on each side of the Otawa Trig. The parking area on Te Puke Quarry Rd. Reid Rd South goes off to the left. 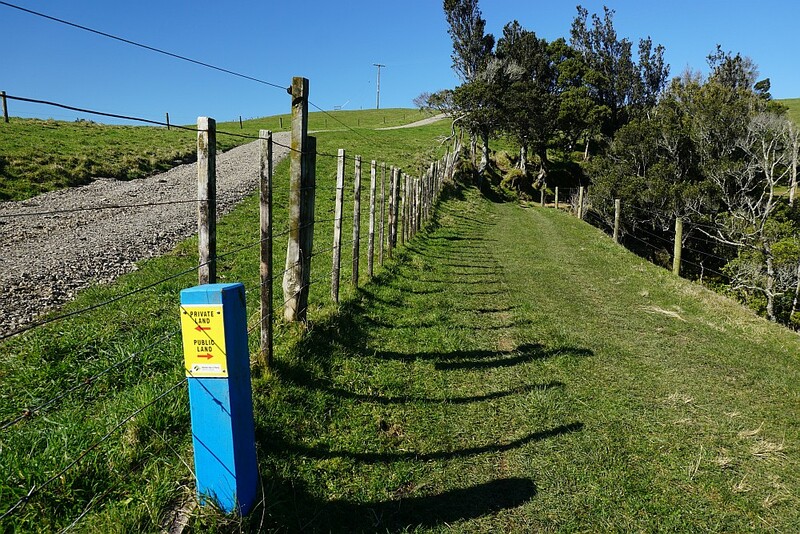 The start of the track is to the right of the parking area, across a stile and through a gate. 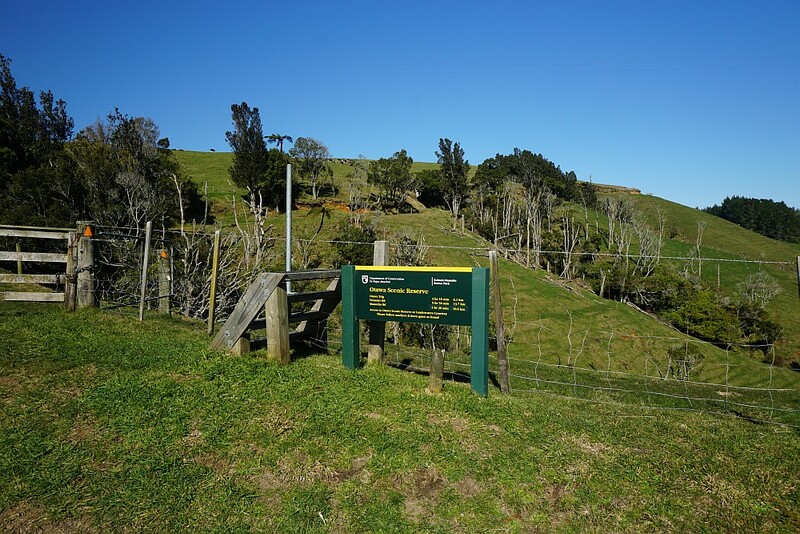 The information panel by the carpark at the start of the walk through farmland. The estimated times and distances are not very reliable. The DoC web site has the walk to the trig and back at 4 hours, and the distance is about 5.5 km. Various other times are shown at other locations along the track. The stile at the start of the walk. 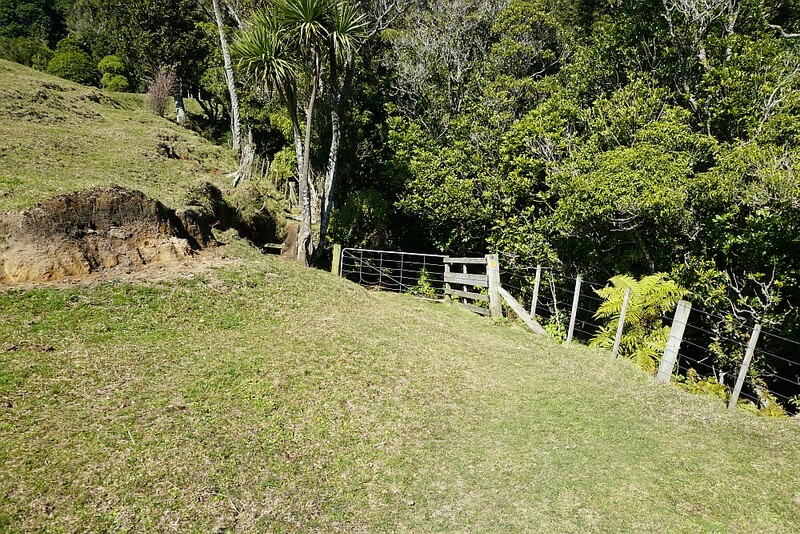 Turn left immediately on the other side of the fence, through a steel gate, and follow the track which runs along the hillside. It can be seen passing through the trees above the information panel. The grass track is wide and well marked, and has fences on both sides most of the way. Looking back at the carpark and start of the track at photo centre. Motiti Island can be seen in the distance above and to the right of the carpark. Various transmission towers are located on the farmland. The boundary of the reserve can be seen to the right. The track continues around the hillside below and to the right of the towers. 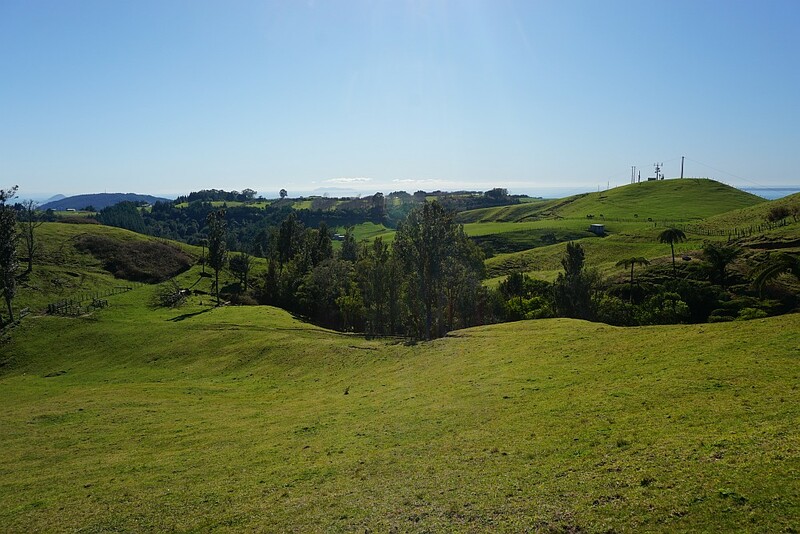 The Whareotetarakeho trig can just be seen at the highest point to the left of the bush boundary. The track will pass this trig station on the return. Looking back from the gate where the return track and the direct track meet. Mauao/Mt Maunganui can just be seen in the distance on the far left, partly hidden by Kopukairua. The gate is locked, so it’s necessary to climb over it to enter the reserve. The first part of the track has very gentle contours, with no steep ascents or descents. All of the track within the reserve is under tree cover, from regenerating native bush. There are some unusual tree forms along the way. 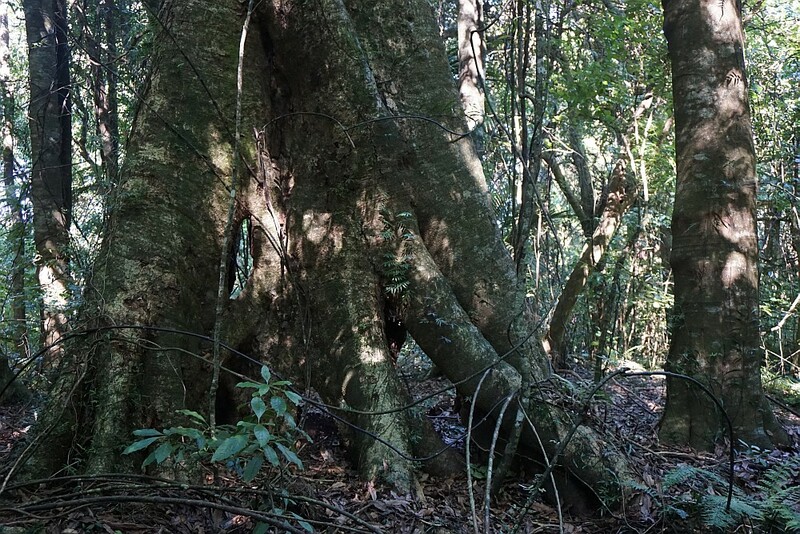 This one has several openings in the base of the trunk. 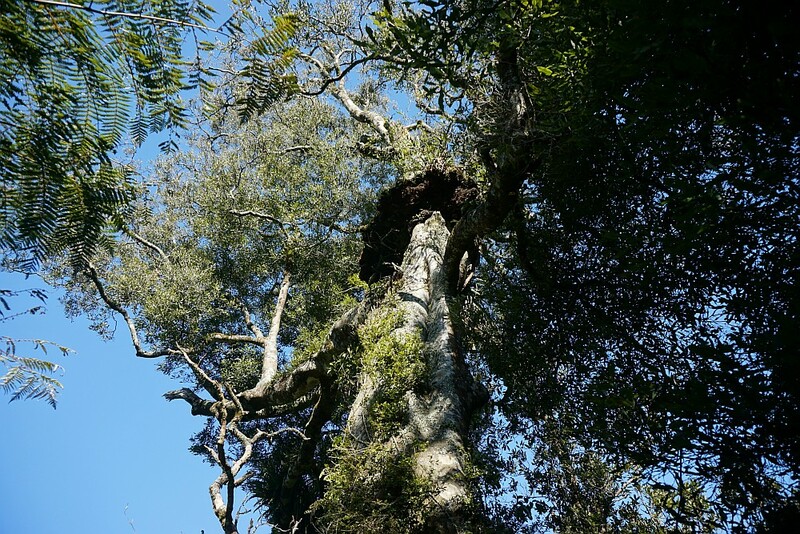 A large tawa tree has a platform growing on the trunk, about 6 m above the ground. 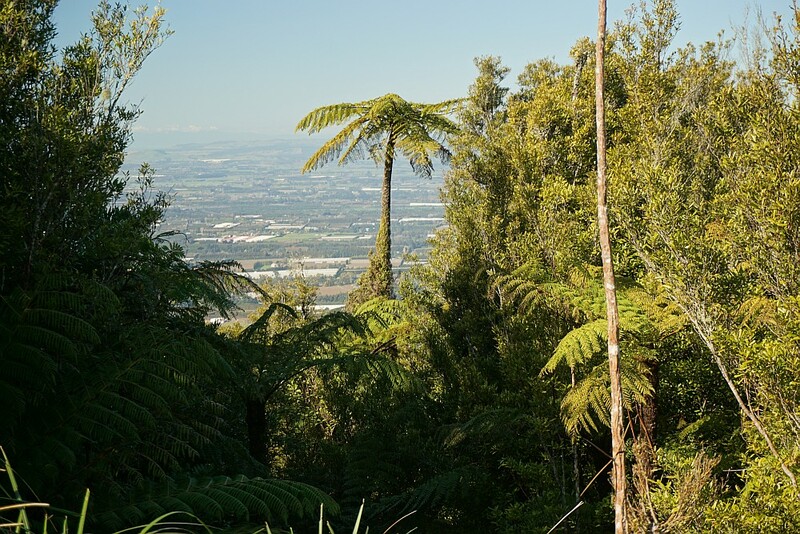 This ponga (tree fern) has another plant growing some way up the trunk. 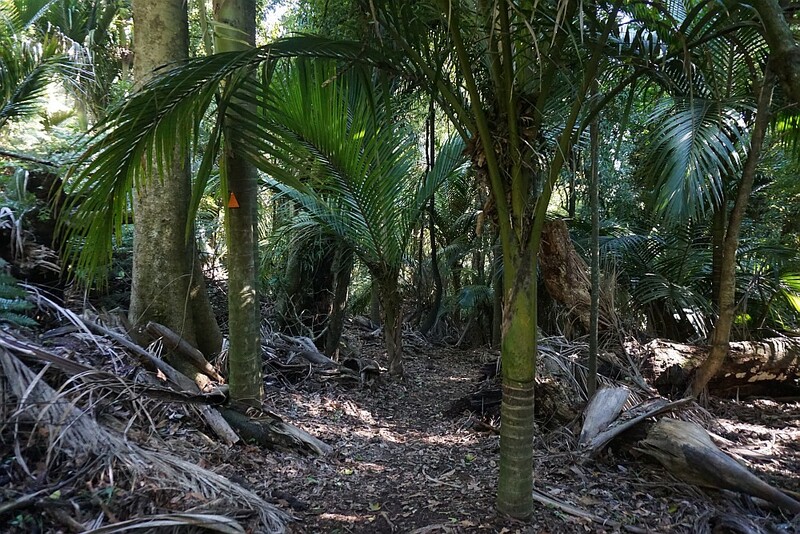 Nikau palms are found in several places along the track. 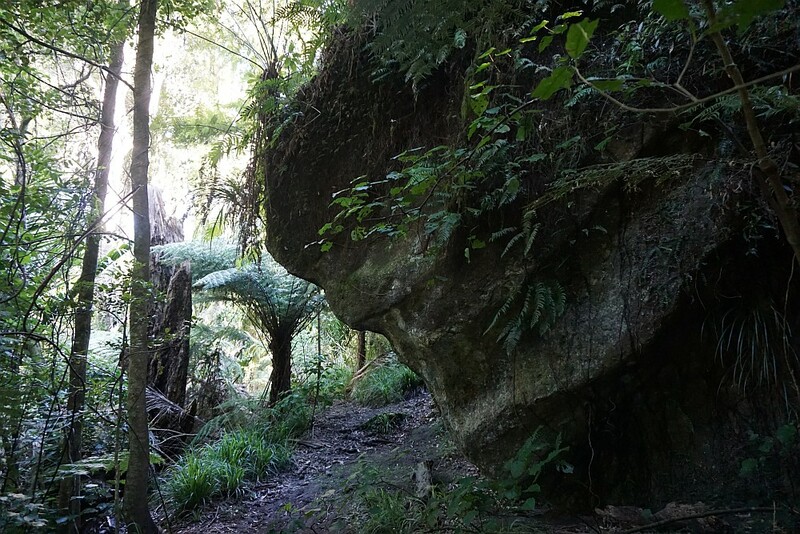 There are very few stones or rocks to be seen along the track, except for this very large rock which appears unexpectedly. 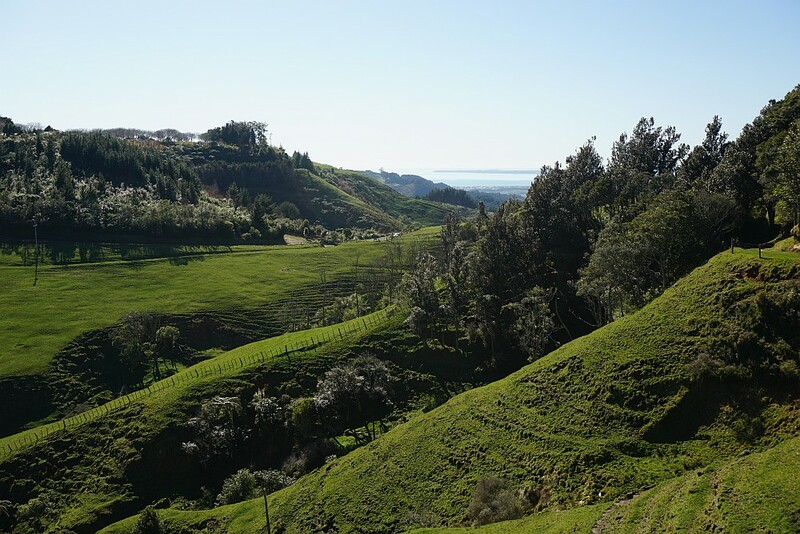 Due to the tree cover there are very few places where the surrounding countryside can be viewed from the track. 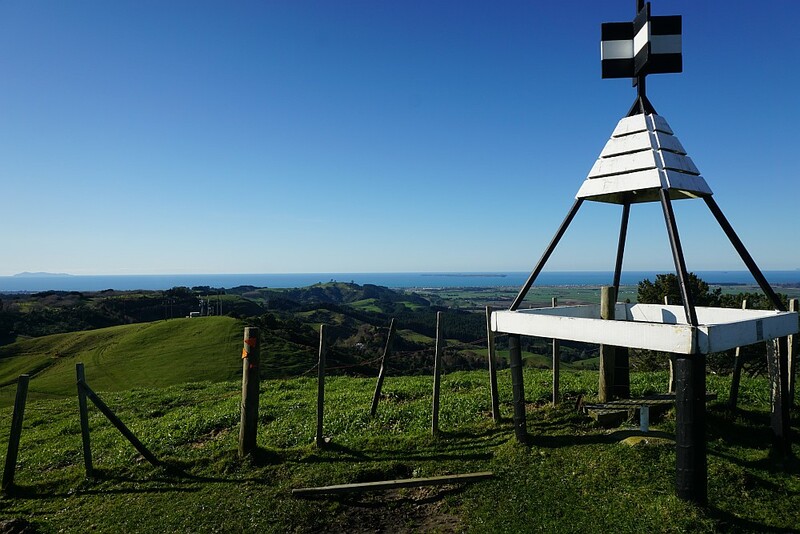 This is one of them, a few hundred meteres from the Otawa Trig, looking out over a very steep hillside across Te Puke and towards the eastern Bay of Plenty. The Otawa Trig station. There are only very limited views from here, and only towards the east. They can just be seen through the legs of the trig station. View from the trig station. An old DoC sign by the trig showing distances and times. Upper Papamoa Rd is the old name for Te Puke Quarry Rd, occasionally still used and seen on maps that have not been updated. Official topographic maps show the trig as being 565 m asl. 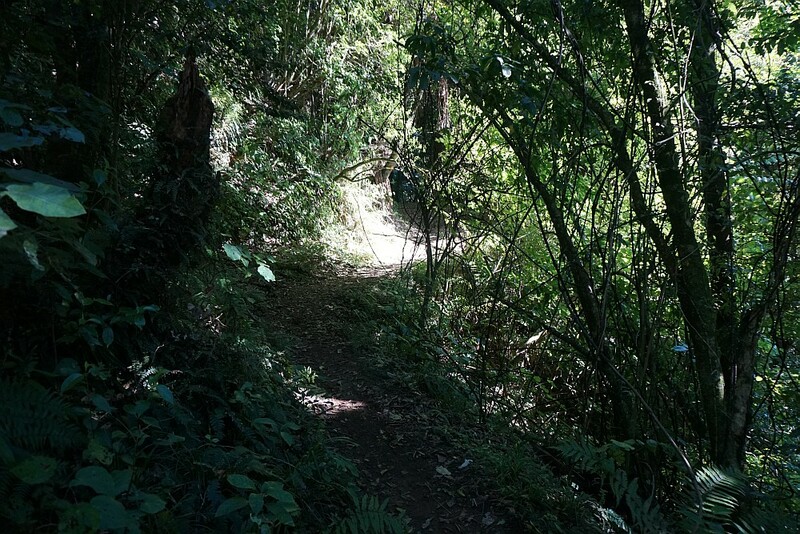 About 400m past the trig, down a steep incline, there is a track junction, with the left branch continuing to Manoeka Rd near Te Puke, and the right branch towards Demeter Rd, and, on a track not regularly maintained, to Whataroa Falls and Otanewainuku. 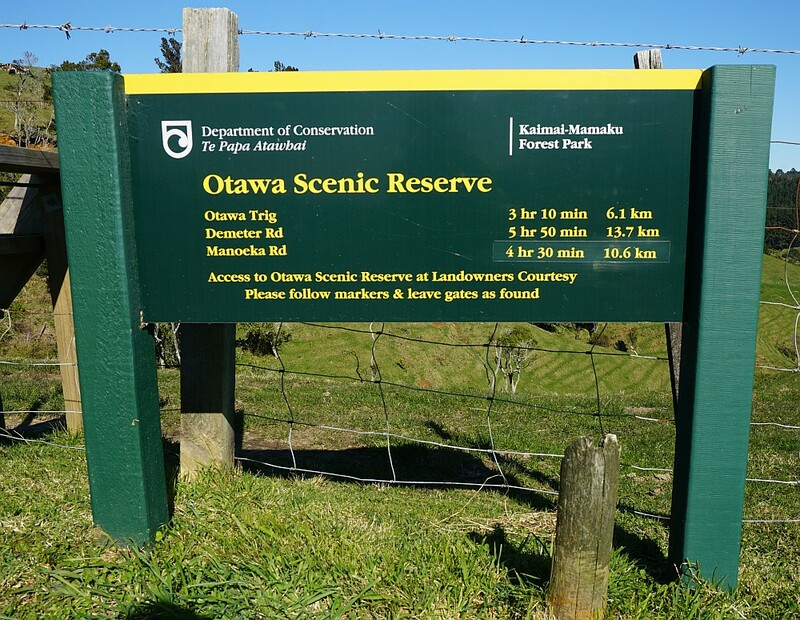 The time from here to the Te Puke Quarry Rd car park is shorter than it is from the Otawa Trig, despite a steep climb back up to the trig. Coming back down the same track towards the car park, near the reserve boundary, the track leading straight ahead exits on the ridgeline at a different location from the entry point. 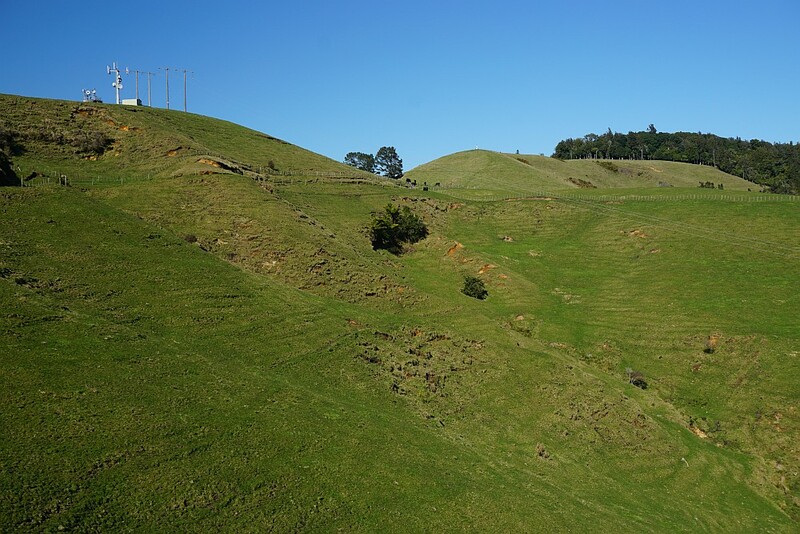 The track continues across the grass area to the Whareotetarakeho trig, just to the left of the tree at the centre. Looking back to the bush entry point, with another old DoC information sign. 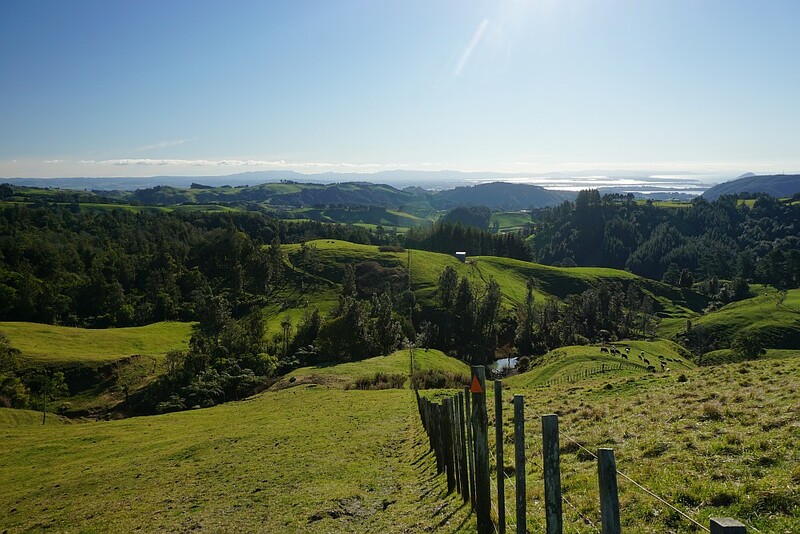 View from Whareotetarakeho trig, with Mayor Island in the distance to the far left, and Motiti Island just left of the trig. There are great views from this trig. 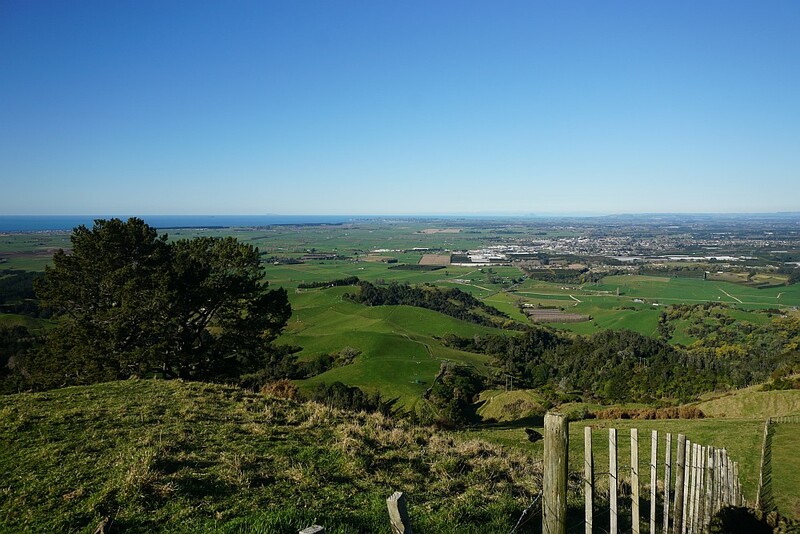 This one looking across Te Puke to the Eastern Bay of Plenty. 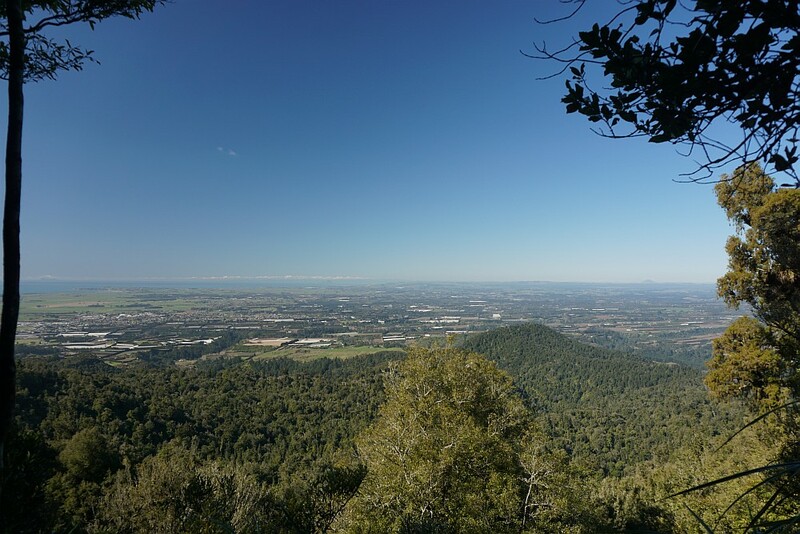 The view towards Tauranga. The track follows the fenceline down the hillside, joining up with the track just below the gorse bushes by the fence. 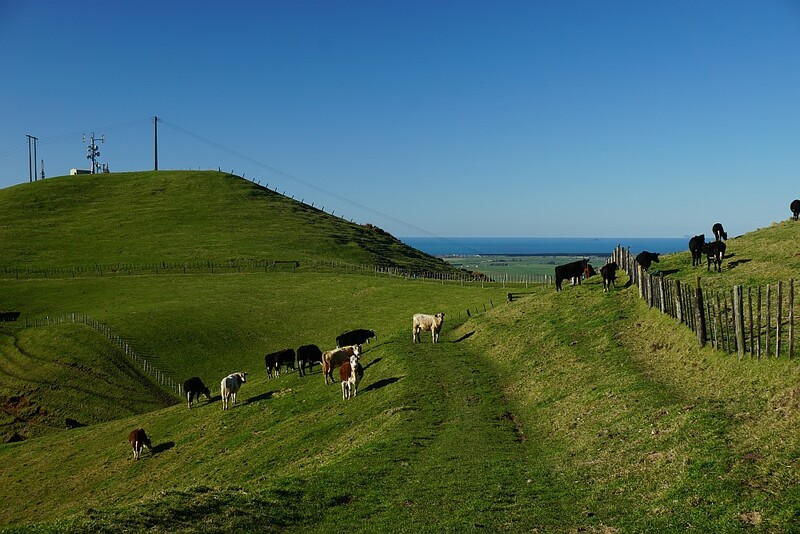 Since the track leads through farmland there may be cattle or sheep grazing on the track. 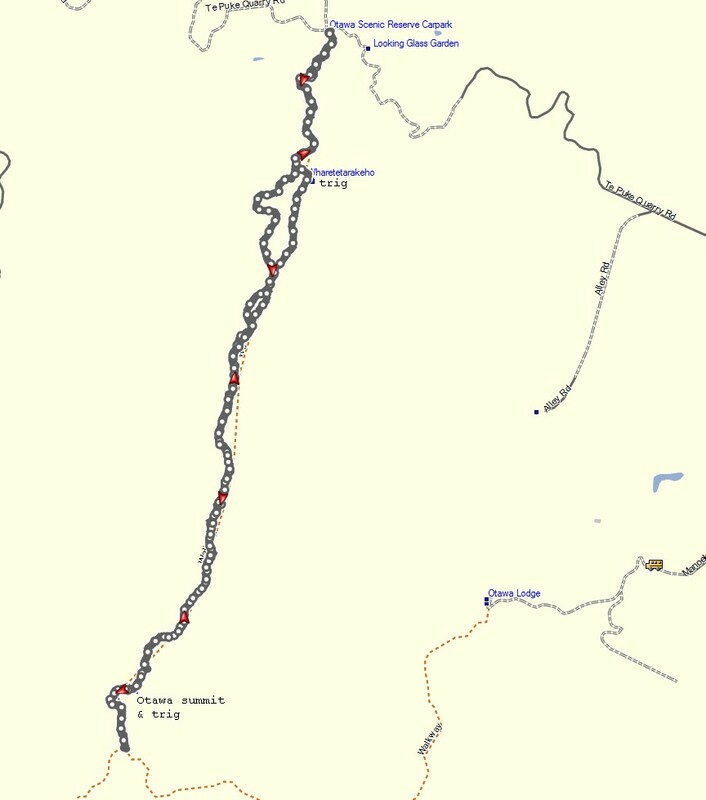 The GPS tracklog shows the route walked, and the locations along the way. The car park on Te Puke Quarry Rd is at the northernmost end of the log. 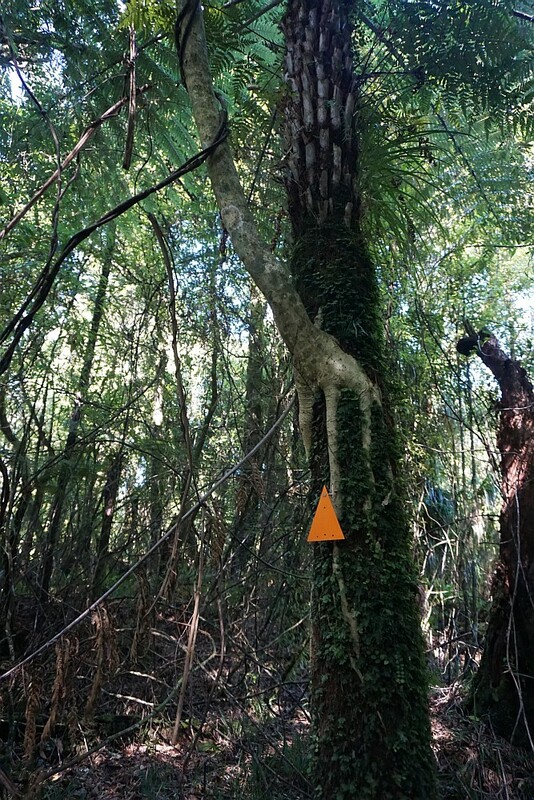 Whareotetarakeho Trig is near the boundary of the reserve. The divergent tracks, the left one on the uphill walk, and the right branch on the return can be seen here. Otawa Trig is near the southern end of the log, about 400m north of the junction of the two tracks. 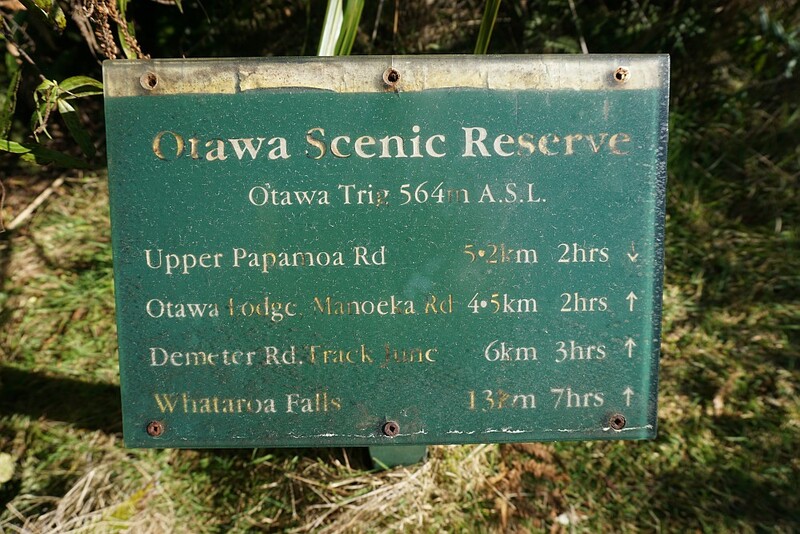 Car park to Otawa Trig: 5.7 km, 1 hour 40 minutes. Otawa Trig to track junction and back: 850m, 25 minutes. Otawa Trig to car park: 5.2 km, 1h 30m. Highest point is the Otawa Trig at 565m, lowest the car park at about 235m. 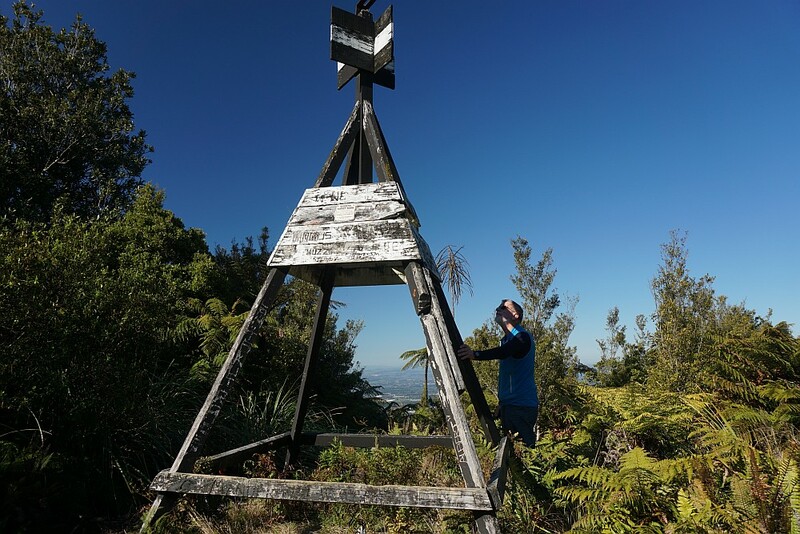 The Whareotetarakeho Trig is marked as 331 m asl. The track was walked on August 13, 2015.